If you are interested send an email to sales@andrasfield.com. If there is more than one person interested I will ask mini Chompski to pull the name out of the hat. All is well, too busy to simfly much these days though. Yeah, 2 small kids and working 1.5 jobs at an airline will do just that. Looking forward to flying online again and haul some stuff around for Andras Meridian. YES.... Congratulations Toby. Great to see you in the plot owners circle finally. My most profound welcomes Toby. Yeaahah, never thought I'd see the day! Thanks all, Single Malts on me! And I would like to say, that it was not really nice to get no answer to the email, which I sent Feb,12th in which I wrote my interest to Field AF31. That you gave it to someone else, is not the problem for me, but to get absolutely no reaction, also no answer after feb,17th (something like:"we are sorry, but...") gives me a bad mood... Espacially for newcomers in Andras Field. Lagavulin would be also a fine thing... ;-) scål! I think if you took the time to read through this fora you would find the answer as to why emails are not sent out but the results are posted. Welcome to Andras Field. Its great to see new people here, and even greater that they would like to purchase a house here, from the beginning. I salute that, and I hope you will try again, next time we have a plot sale, which will be next weekend already. As for the missing response to the ones who were not the lucky ones, it has been policy here since forever, as there have sometimes been 40 people wanting a plot, and Chompski, our Sales Director, simply havent time to write response emails to each and everyone, so he has written on this forum, that he wouldnt, hence the words above, about search functions and all. Its all true but as a new user in Andras Field, there can be a lot to read through. I hope you will enjoy Andras Field with us, and as I said, please try for a plot next week. Kind regards and welcome to. I´m 47years old, living in Düssldorf (and like Single Malt very much... ;-) ) and have started with FSX a half year ago. 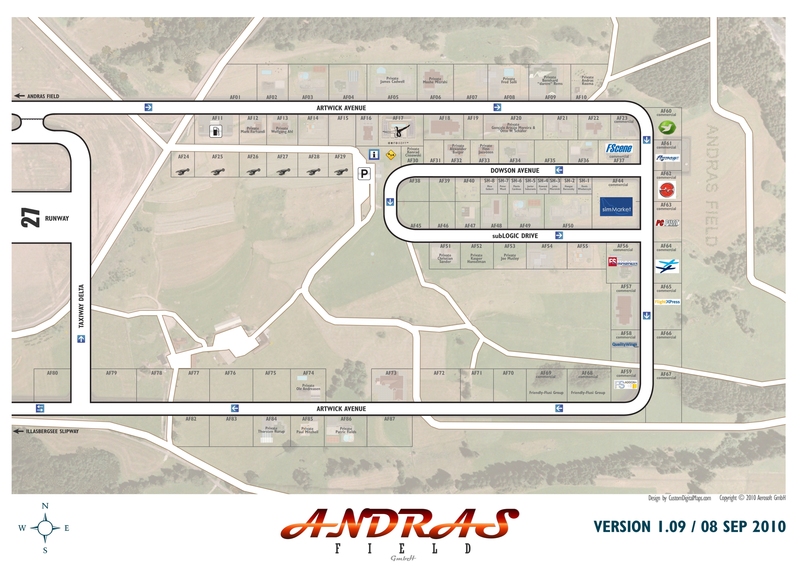 And I liked the discription of Andras Field so much, that I decided to download it immediately. I like the area and the airpark.... I downloaded the Jenny (freeware), there you can download a little oldtimer too. So I went to the park with the old Ford T an had a look to all the houses and garages. Very nice! And so I decided to buy a plot also there.